﻿ What is Audio Description? How Do I Receive Audio Description? How Do I Become an Audio Describer? Certification for Audio Describers Proposal and ACVREP's "Process For Establishing A Certification"
Audio Description involves the accessibility of the visual images of theater, television, movies, and other art forms for people who are blind, have low vision, or who are otherwise visually impaired. It is a narration service (provided at no additional charge to the patron) that attempts to describe what the sighted person takes for granted -- those images that a person who is blind or visually impaired formerly could only experience through the whispered asides from a sighted companion. In theaters, in museums, and accompanying television, film, and video presentations, Audio Description is commentary and narration which guides the listener through the presentation with concise, objective descriptions of new scenes, settings, costumes, body language, and "sight gags," all slipped in between portions of dialogue or songs. How Do I Receive the Audio Description? In theaters and similar venues, the user hears the audio description via a small earpiece or earphones connected to a tiny receiver. 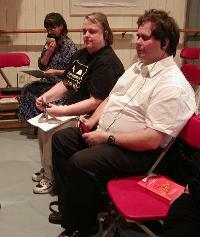 For live performances, a trained Audio Describer transmits the descriptions from elsewhere in the theater often using a court stenographer's mask microphone (picture right, describer holding mask mike to mouth). For movies, the description generally has been prerecorded and synced to the movie soundtrack (though sometimes this is done live). For television, the audio description is termed video description in the USA and has historically been transmitted to the user via the Second Audio Program or SAP channel on their TV or VCR, which must be capable of receiving SAP signals. Most TVs and VCRs manufactured since the early 1990s are equipped to receive SAP, which is usually activated through the MENU button on the remote. However, with the transition from analog to digital TV, things are changing. See Accessing Audio Description on Your TV. For videos distributed on DVD, the audio description, when available, is accessed via the DVD menu for the movie as a special feature of the Languages menu. The track can often be located simply by repeatedly pressing the Audio button on the remote. Some libraries distribute DVDs or VHS tapes of older movies with audio description added. Such media are also available for purchase at a few places. See the links at the bottom of Audio Described Movies. You may download the following audio description symbols for your own use by right-clicking them and selecting the appropriate download option (such as "Save picture as..."). With the exception of the last one, they are all 100 by 100 pixels. Credit for the "invention" of audio description in 1981 generally goes to the late Dr Margaret Pfanstiehl and her late husband Cody, although in independent efforts a man named Chet Avery proposed the concept in the late 60s, and Gregory Frazier worked on the idea on the 1970s. In 1990, the National Academy of Television Arts and Sciences awarded Margaret an Emmy for her "leadership and persistence in the development of television for the visually impaired." In 2009, Margaret received the Excellence in Accessibility Leadership Award at the LEAD Conference at the Kennedy Center for her lifetime commitment and enduring advocacy on behalf of audio description and other forms of information access for the visually impaired community. Over the years, the Pfanstiehls personally trained hundreds of audio describers around the world. Since then, many of those trained describers have gone on to train other audio describers. Audio Description Solutions has a very nice timeline of the history of audio description, so we won't duplicate it here. Also, Dr. Joel Snyder's book, The Visual Made Verbal: A Comprehensive Training Manual and Guide to the History and Applications of Audio Description covers the history of AD in great detail, and he has offered us this excerpt from his book on the history of AD. Today, many large cities have organizations with trained audio describers who offer their services for free or fee to local theatre groups and others. Most of the organizations are setup as non-profits. There are also professional audio description organizations (such as WBGH Media Group) who do description primarily for movies. You can find both types of organizations listed on our AD Services web page. First, you need to find out if there is a local organization which trains and uses audio describers. Consult our AD Services web page. If they offer training, you will probably have to "pass" an audition. They will want to know what your reading voice sounds like. Do you have a strong accent? Do you enunciate well? Do you stumble or stutter? How good is your command of English (or your local language) and your vocabulary? Remember: an audio describer's voice should never be distracting from the performance being described, so the organization will be looking for people with pleasant voices and good command of the language. Note: for professional production of description in media, the audio describer writes the AD script, while a professional voice-over artist typically voices it; thus the issue of a describer's voice characteristics may not be relevant. And by the way, the fundamental rule of audio description is, "Say what you see." This is not a job where your ad-libs or your interpretation of what you see is appropriate! Want to become a describer or brush up on skills? See our Training/Education page. Please see the links at the top of this page for additional reference material on audio description!